A rare blend of eloquent lyrical craft and explorative musicianship, the songs of Tiny Ruins have been treasured by crowds and critics for almost a decade. Traversing influences that cross genre and era, the artistry of Hollie Fullbrook and her band spans delicate folk, lustrous dream pop and ebullient psychedelia. Born in Bristol and raised in West Auckland, Fullbrook's debut LP Some Were Meant For Sea (2011) features her alone, and was quickly celebrated by radio playlists and blogs worldwide. The album’s clutch of “gorgeous vignettes” (BBC) put the artist on the map, and she took to the road from her home in New Zealand to tour extensively through the UK, Europe and North America – a passage repeated many times since. Second album Brightly Painted One earned more accolades, championed by the New York Times, NPR and David Lynch, and winning Best Alternative Album at the New Zealand Music Awards in 2014. “An album of quiet, devastating beauty,” wrote Pop Matters. The album saw Fullbrook join forces with producer Tom Healy, whom, alongside long-time tourmates bassist Cass Basil and drummer Alex Freer, Fullbrook has worked and toured with ever since. 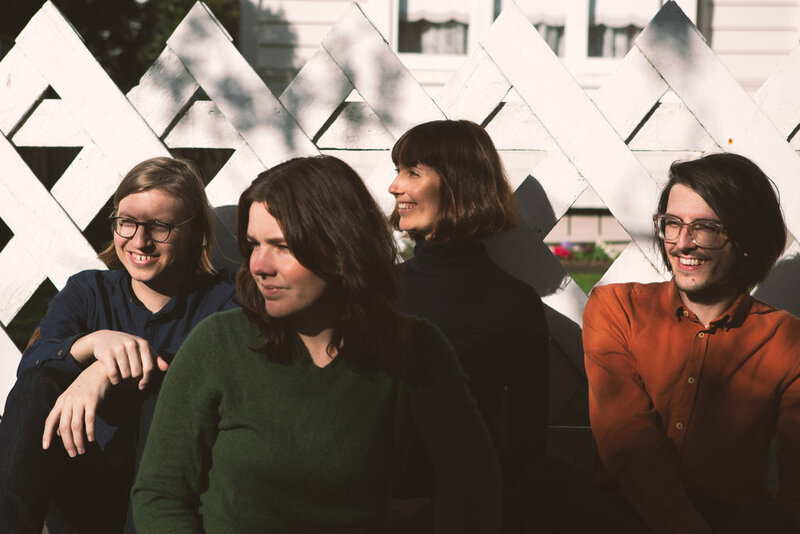 Building on the sparse minimalism and mesmerising songwriting of earlier releases, third album Olympic Girls comprises a taut and agile quiver of songs, dancing with explorative instrumentation and a pop sensibility that springs with life. “How much would you be willing to give?” Fullbrook asks point-blank in first single ‘How Much’, ahead of woozily discordant strings and a stomping neo-psychedelic rhythm. The lyric brims with imagery of supermarket breakdowns, lilos, snarks and silos while an anthemic guitar hook soars throughout. Not content to leave the song at a stable conclusion, a thumping ‘I am the Walrus’-esque bass outro propels the track boomerang-style back to a space of adroit experimentation. A group renowned for their electric dynamic live on stage, Tiny Ruins have played stages in solo and varied group formations across countless cities and states with Sharon van Etten, Calexico, the Handsome Family and more. Following the release of Olympic Girls on Feb 1st 2019, the band will be touring throughout the UK, Europe, Australia & NZ. See Tour Dates.